I am not afraid. Finding strength in difference. Hi, I’m Beth. 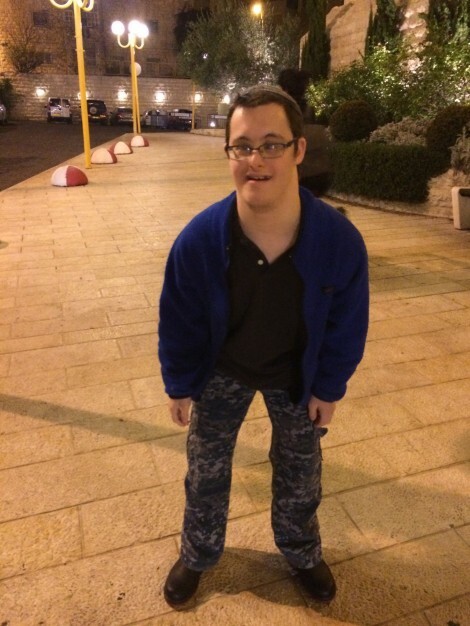 I’m mother to Akiva, who’s 17 and has disabilities. My son’s challenges are significant but I’m not afraid. I am unsure about the future. His happy adulthood, my happy years as an older adult. What are his rights, what do I deserve, what will be the responsibilities his older brothers will shoulder? Will he be happy? I worry he might not be happy. But he’s almost always happy. That makes me less afraid. When I talk about our journey as a family – the tough moments, the tearful moments, the moments that I just wish it were different – I try to be honest. I know honesty is important. I know many people pity us, pity him, don’t truly understand what it means to be his parent, his full-time advocate, his person, his people, his caring community. We’re the people who help him shower and dress, who care for him when he is sick, who sing songs with him. We’re the people who love him. Sometimes, I wish it were different but I am not afraid. When I post a picture of Akiva, I choose the happy ones, the ones where his cute, uneven teeth, his often crossed-eyes, his sometimes grubby face, are softened by the happy smile on his face. He’s kinda funny-looking but aren’t we all? I am not afraid to show the face of disability – his disabilities that is – via my son. I am not taking advantage of his well-being. I am letting the world know that disability is happy, disability is every emotion and more. Just like not having a disability is so many things and so many emotions and so many experiences. I am not afraid of exposing us, of sharing him. While I know he’s unaware of this exposure, I know that showing him to the world, my extended world, will help ease fears and misconceptions about disability. I hope. But I am afraid of a world that treasures beauty. Where skinny bodies and 6-pack abs, along with being blonde and gorgeous, is regurgitated on television and in movies. There are few positive images shown of real people who look different, as opposed to actors playing a part. I’m afraid of a Jewish world that treasures learning. Where how many degrees and how much you earn, gets more respect than your dedication to being a good person, an inclusive person, a person who believes that we were all created in G-d’s many images. I’m afraid for other parents of children, teens and adults with disabilities. Those who feel unsure that the world will appreciate their loved ones. That the world will look kindly on their stories. Their tales of difference and challenge, of unusual beauty lost and found. I’m afraid of a world that divides people up according to who can and who can’t. A world that divides those with disabilities according to who’s got this and who’s got that. A world that decides who’s high-functioning – whatever that really means – and who’s not. A world that sentences you and judges you for your difference without knowing what that really means. So, I work past the fears. I tell his story. I tell our story. I invite you in, to read, listen and comment, so that you can understand and appreciate. So you can smile at the different-looking-behaving-whatever person the next time you see them on the street and be glad that they’re a member of your community. Because their people, those who love them, need you to try to be less afraid. My dad was ahead of his time. He chose to become a vegetarian in the 1930’s, no doubt influenced by Harav Kook’s philosophy of vegetarianism as an ethical way of life. My dad believed that being mindful of what we eat together with daily exercise was the path to a healthy body, mind and spirit. You might say “duh!” today but he was living according to these principals at a time when everyone around him was eating steaks every night, smoking, drinking and living extremely sedentary lives. He maintained a vegetarian diet even during his service in the US army in WWII – telling us stories of how he dreaded KP (kitchen patrol) during basic training – “The chazer, uch!”. Thanks to my dad, I’ve been a vegetarian all my life. But I wasn’t always grateful. As a kid growing up in suburban New York, the question kids most frequently asked me was “You’ve never had a hamburger?”. The answer was and still is “No.”. We didn’t even eat peanut butter and jelly sandwiches. My mom’s definition of a sandwich was a two inch pile of lettuce with some cheese. There was nothing to trade in my lunch box. Talk about weird. Being a vegetarian kid in the 60’s and 70’s was weird. I only started meeting other vegetarians as a teen when friends started ‘converting’. Since there was never a vegetarian option at events, my mom would give us dinner before we went even to the fanciest of weddings, a habit I’ve only recently been able to break. Camp was a real problem since we weren’t just “non-meat-eaters” we were “healthful eaters” and that was in direct opposition to camp fare. The list of how growing up vegetarian set me apart is long and having passed the “torah” on to my children and grandchildren, the sense of difference gets passed along too I think. Every year in May I wonder how Yom Ha’atsmaut became the day of burnt offerings. It’s a relatively recent phenomenon since I remember people just enjoying nature, picnicking, going to the beach. My fondest memory of Yom Ha’atsmaut when I first arrived was riding bikes to the beach in near empty streets and having a picnic without the stench of “mangals” burning all around me. I think Israelis see the barbecue as a sign of affluence and I know people love it with a passion. I guess I will always be looking at this minhag (tradition) from the side, with a perplexed look and a nauseous feeling in my stomach.